A versatile theatrical company has developed a taste for the absurd for its latest production. 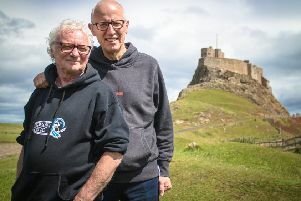 Cloud Nine, based in Cullercoats, will present The Stolen Rubber Band at five coastal venues next month. The play has been penned by the company’s artistic director Peter Mortimer and sees the main character attempt to solve his financial problems by the theft of the eponymous rubber band, but to do so, he must confront a series of bizarre obstacles and learn the language of Gargle. Directed by Neil Armstrong, the all-male cast of three will offer up a fast-paced production full of trickery, practical jokes, sleights of hand, verbal gymnastics, and even a watering can. Each performance will also include a first half live music set by some of North Tyneside’s most talented musicians. The play can be seen at Low Lights Tavern, North Shields, from Monday, October 19, to Wednesday, October 21, with tickets available on 0191 257 6038; the Surf Cafe, Tynemouth, on Thursday, October 22, tickets on 0191 447 1503; Yoga Station, Whitley Bay, on Friday, October 23, tickets on 07875 597049; Whitley Bay Football Club, a new venue for the company, on Saturday, October 24, tickets on 0191 291 3637; and Whitley Bay Comrades Club on Sunday, October 25, with tickets on 0191 251 3829.
l Cloud Nine will also be reviving its award-winning Death at Dawn production, based on events from the First World War, after securing a grant of £14,000 from Arts Council England. It can be seen with the original cast in February for a week at Wallsend Memorial Hall, followed by a week’s run at Newcastle’s Discovery Museum.